WASHINGTON (CNS) — A Vietnamese-born Salesian priest has offered to President Donald Trump that he would trade his own U.S. citizenship with a refugee to allow into the United States someone from one of the countries Trump listed in his Jan. 27 travel ban. Father Chuong Hoai Nguyen, a Salesian of Don Bosco, who is serving in California, is a refugee-turned-U.S. citizen. 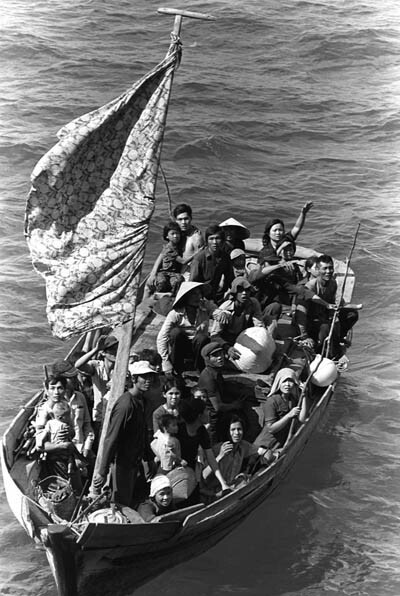 He came to the United States as one of the Vietnamese “boat people” following the 1975 collapse of South Vietnam. His citizenship offer came in an open letter to Trump Jan. 27, the same day the president issued an executive order that suspended the entire U.S. refugee resettlement program for 120 days and banned entry of all citizens from seven majority-Muslim countries for 90 days. The order has been held up in court. Father Nguyen said he has heard nothing from the White House since his open letter to Trump was published. The date on the letter, which has appeared on Commonweal magazine’s blog and been the topic of a number of stories, also was the beginning of the Vietnamese New Year, called Tet. The priest told Catholic News Service in a telephone interview that he has talked with his superiors in the order about ministering in the country native to the refugee who would be the beneficiary of the swap. “Whenever you’re ready, we’ll pick you up and reassign you,” he said, is the message he got from his conversation with his superiors. Although Father Nguyen told CNS he had been battling the flu for most of the three weeks since he wrote his letter, “I did send it three times” to the president. “But with all the busyness and the chaos that we read on the news,” he said he understands if it hasn’t been read. Father Nguyen said he could see himself ministering in Syria, one of the seven Muslim-majority countries listed by Trump in his Jan. 27 order. With courts in Washington state and Virginia having stymied implementation of the order, the White House has said it will reissue it. In his letter to Trump, Father Nguyen described his refugee experience. Since coming to the United States, “I have done my best to ‘make America great,'” he said, talking in the letter about his joining the Salesian order in 1979 and his ministries while in the priesthood. Father Nguyen currently is director of youth ministry and a youth retreat specialist at St. Joseph Salesian Youth Renewal Center, in Rosemead, California, and chaplain for the Vietnamese Catholic community at San Gabriel Mission in the Archdiocese of Los Angeles.